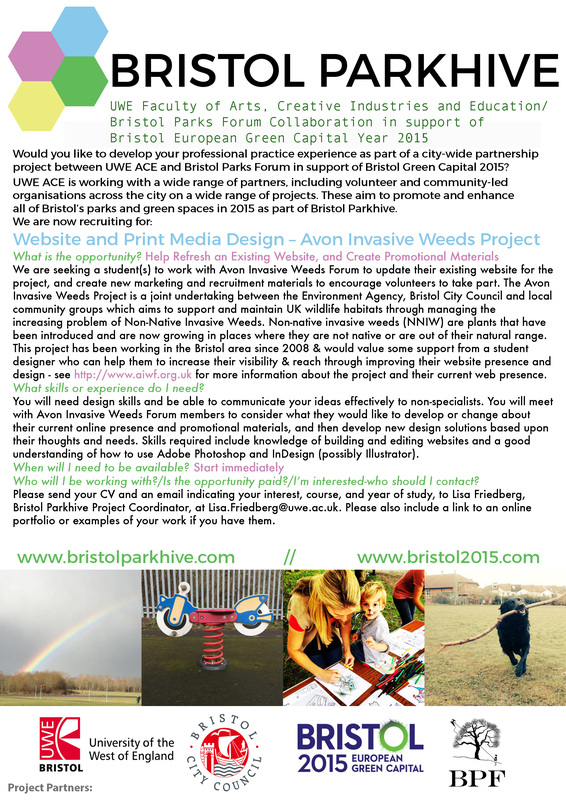 This project is part of Bristol Parkhive - a UWE ACE project in support of Bristol’s title of European Green Capital 2015. We aim to promote the great work done by neighbourhood, volunteer-led parks groups as they work to maintain and improve their local parks and green spaces throughout the city. We are seeking a designer to work with the Avon Invasive Weeds Forum to update/refresh the existing website for the project & create new marketing and recruitment materials to encourage volunteers to take part. The Avon Invasive Weeds Project is a joint undertaking between the Environment Agency, Bristol City Council and local community groups which aims to support and maintain UK wildlife habitats through managing the increasing problem of Non-Native Invasive Weeds. Non-native invasive weeds (NNIW) are plants that have been introduced and are now growing in places where they are not native or are out of their natural range. There are a number of weeds in the UK that are now classified as invasive, the best known 3 being Japanese Knotweed, Himalayan Balsam and Giant Hogweed.in Avon. This project has been working in the Bristol area since 2008 and would value some support from a student designer who can help them to increase their visibility & reach through improving their website presence and design - see www.aiwf.org.uk for more information about the project and their current web presence. If you would like to get involved in a self-contained project as part of Bristol Green Capital- this could be for you! The Role: We are looking for students who like to work on their own, or in small teams of two or three, to work with the project manager of Avon Invasive Weeds Forum to update/refresh website for the project & create new marketing and recruitment materials to encourage volunteers to participate in the project. This work could also include refreshing the logo for the group as well- we will confirm this with you (and them) before you get started. Skills & Attributes required: You will need design skills and be able to communicate your ideas effectively to non-specialists. You will meet with Avon Invasive Weeds Forum members to consider what they would like to develop or change about their current online presence and promotional materials, and then develop new design solutions based upon their thoughts and needs. Skills required include knowledge of building and editing websites and a good understanding of how to use Adobe Photoshop and InDesign (possibly Illustrator). This is a great opportunity for students to work on a professional live brief while making a real difference by supporting parks groups activities in the community! Please send your CV and an email indicating your interest, course, and year of study, to Lisa Friedberg, Bristol Parkhive Project Coordinator, at Lisa.Friedberg@uwe.ac.uk. Please also include a link to an online portfolio or examples of your work if you have them.